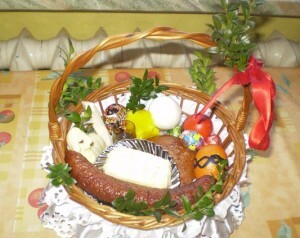 Easter is considered as one of the most important occasions for Christian Catholics. They celebrate this day with so much devotion and passion. Several traditions and festivities are also observed during this day. But aside from the traditional observances, Easter has become a time for fun and spring activities as well. Like other holidays, Easter can demand our pocket to spend more than we have planned to. We spend for lots of treats and surprises! There are also many Easter crafts to create. And one of those things we need to have and spend for at Easter is a good Easter basket. Well, there is no need to fret anymore because Easter baskets are readily available wherever you are provided you use your creative mind to make one! 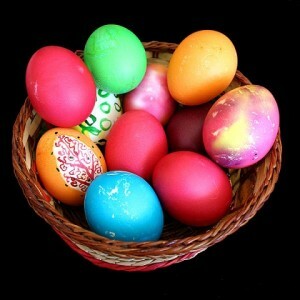 Check out the following suggestions for you to fashion your own beautiful Easter basket without spending too much. Straw hats come in different styles and colors. If you have one at home, use it to make an Easter basket. Reverse the straw hat and use colourful laces to decorate it. A matching ribbon can be used to design a handle for the straw hat basket. Soda bottles can be durable Easter baskets. Cut the upper half of a 2-liter soda bottle. Bore a hole on opposite sides of the bottle where to place the handle. Use a pipe cleaner as handle by inserting it in the holes. Bend the pipe cleaner like a bow to be able to act as the basket’s handle. Finally, you can add decorations to the recycled bottle by hot gluing ribbons and laces to its edges. Plastic pails of different colors can be recreated to produce unique Easter baskets. They can be covered with Easter stickers or be painted with Easter Rabbits and other animals. You can also use cloth, sequins, buttons, ribbons, and laces to make the pails look more like Easter Baskets. Strawberries come in their containers. Recycle the strawberry container into an Easter basket. Innovate a handle by using a wire or a pipe cleaner. Ribbons can also be woven at its edges and be made into a handle. Whichever style you choose for a handle will still make a good choice. Reuse your wicker basket and add Easter themed objects to make it look like an Easter basket. A touch of Easter eggs and candies will give the baskets a real look for the Easter theme. Keep the used wicker basket and recycle it again when the holiday calls for one. This ensures cheaper way of obtaining Easter baskets every year. Dress your paper bags with Easter stickers or pictures of Easter Bunnies and other Easter objects. Give it a twist by adding other details to it like handle made of woven paper or a ribbon. You can also cut out construction papers into long, ear-shaped outline (like the ears of a bunny) and attach them at the sides of the bag to appear like ears. Then draw the face of the Easter bunny at the front of the bag. This will create a very unique Easter basket with the face of Easter bunny being carried along by your kids. Fill the bag with Easter gifts and goodies and there you have it— a new Easter basket! Easter bonnets or any other bonnets can be turned into Easter baskets.This is similar to the straw hats. Turn them upside down and use ribbons as handles. Ribbons, pins, and other decorative pieces can be added to your improvised Easter bonnet basket. Plunk in your Easter treats and goodies for a complete transformation. Your kids’ lunch boxes can be good Easter baskets. Give the lunch box an Easter style by decorating it with Easter pictures, stickers, and laces. Cover the handle with any colourful fabric. Put ribbons to accentuate its attractiveness. When finished, your kids will hardly be able to distinguish between the old lunch box and the Easter basket they are holding. Grocery bags aren’t just for groceries. They are also for Easter! With some creativity, the grocery bag can be masked with Easter decorations. Paste and stick pictures of Easter bunnies, Easter eggs and candies, and even Easter fruits and veggies. You can improvise a handle by using strings of paper or ribbon. But the most important part is to stuff in the bag with your kids’ favourite foods and pastries. That will surely give them a treat! 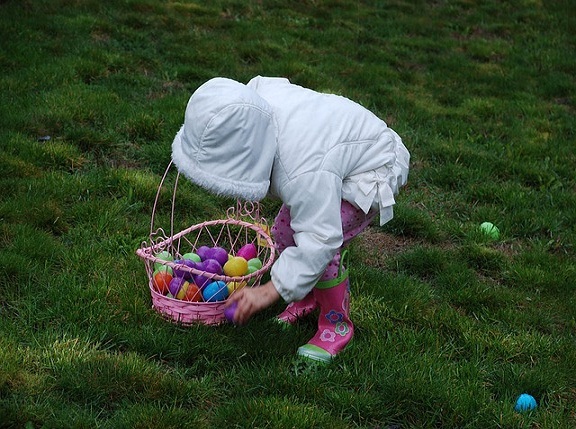 Flower pots can be easily converted into Easter baskets by fastening a handle made of wire or pipe cleaner. Ribbon can also effectively work as handle. You can repaint the pots according to the color you desire and draw Easter pictures in it. If repainting is too much a task for you, you can cover the flower pot with colourful plastics, paper, or fabric. 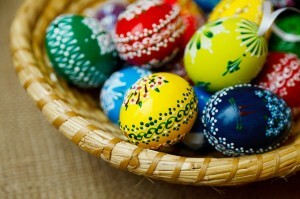 You can paste, glue, or sew decorative items to your pot to make it favorable to use as an Easter basket.